Happy birthday to Ceasar Chavez | Jon Katz, P.C. Reprinting my 2011 tribute to Ceasar Chavez. 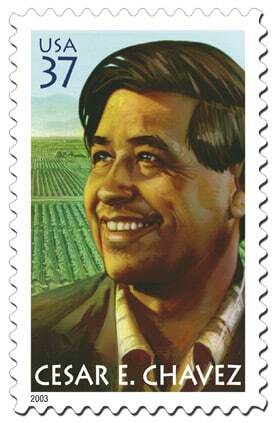 For years, I have seen Mr. Chavez — a founder of the United Farmworkers — as a champion of workers and immigrants. – Brief talk by Chavez, including his getting irritated at one of his questioners, despite his above patience quote. – Excerpts from the The Fight in the Fields documentary. – A lengthier segment of The Fight in the Fields. – A short biography of Chavez, and another one here. Ceasar Chavez also was a fellow vegetarian, which is particularly curious when considering that farm work ordinarily includes animal slaughter, unless the United Farm Workers — which Chavez founded — only dealt with produce farm work. Happy birthday, Ceasar Chavez, Thank you for the personal sacrifices you made for social justice and to better the lives of those who started with little power and influence.